Corporate Governance of Information Technology is the system by which an organisation's current and future use of IT is directed and controlled. 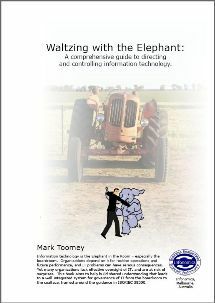 This landmark book explores, in plain language, the need for organisations to effectively govern their use of information technology as part of governing the organisation, Waltzing with the Elephant explains how business leaders can engage on their terms, in their language, and exert effective control through a comprehensive, fully integrated system for governance and management that parallels the systems used to govern other assets and resources. See reviews and ways to buy now. Digital Transformation is front of mind for many business commentators and leaders - but how do business leaders step up to a role for which they are unprepared, and which in the past looked like the domain of information technology specialists. In this new book, due for release in late January 2014, Mark Toomey lays out a model for these business leaders to become Digital Leaders, inspired by the ISO 38500 standard and the 1965 research of H J Leavitt. Read the draft preface now, and seize your opportunity to pre-purchase the book at a 25% discount from its future sale price. Commencing in Perth on 24 February, Mark Toomey will spend the next six weeks travelling the nation to deliver briefings and 2 day classes on Digital Leadership and Governance of IT. This series is organised and managed by the Australian Computer Society. Special Pricing on Waltzing with the Elephant and Digital Leadership Manifesto until 11 April 2014. See The Infonomics Shop for details. This website is a constant work in progress. Please excuse the gaps while we complete the work. Infonomics moved to a new hosting provider, on 4 April 2012. Some links may be broken. Please be patient as we fix them. Copyright © 2012 Infonomics Pty Ltd.